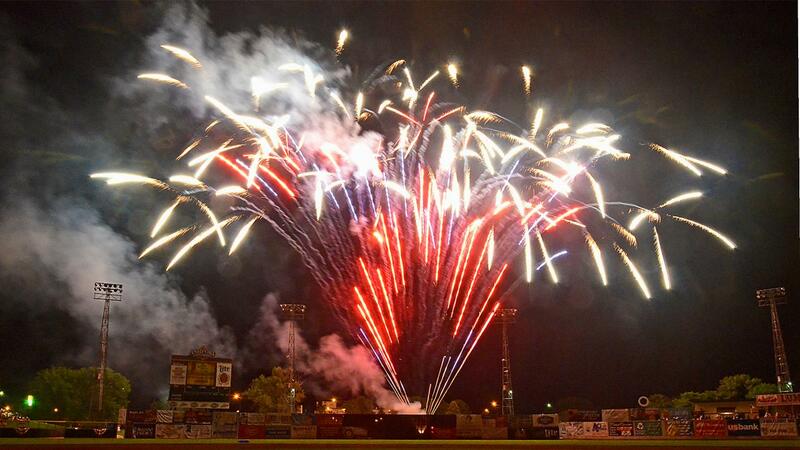 The Clinton LumberKings will host four Fireworks Spectaculars in 2019! Clinton, IA (March 14, 2019) - The wait is over and the Clinton LumberKings are excited to announce their 2019 Promotional Schedule. This season will feature four fireworks nights, six post-game concerts, two bobblehead giveaways, and 10 Copa De La Diversion days. The LumberKings will host the first of their 70 scheduled home games on Saturday, April 6 when they meet the Kane County Cougars in the home opener. The 2019 season will feature 21 separate giveaway nights and the chance to win Allegiant Air Flight vouchers on - April 19th, May 17th, June 28th, July 26th, August 23rd. Both LumberKings' bobbleheads will be unique. On Friday, July 12th, the first Casey's and Mediacom bobblehead giveaway of the year will be of the muscular 2014 LumberKings outfielder - and current St. Louis Cardinal - Tyler O'Neill. During his only season in Clinton, he batted .247 with 13 home runs and 38 RBIs. Two of his home runs came as Grand Slams - a team record for a single season. While O'Neill's head will bobble, it is his bobbling bicep that will make this bobblehead something like no other. The last 30-game winner in Major League Baseball, Denny McLain will be the subject of the second and final Casey's and Mediacom bobblehead giveaway of the year. The future two-time Cy-Young award winner spent the majority of his 1962 season in Clinton and went 4-7 with a 3.56 ERA and 93 strikeouts. McLain will be in Clinton at the game to sign autographs and meet fans for a bobblehead giveaway that has been nearly 60 years in the making. Both bobblehead giveaways will be given to the first 750 fans through the gates. A staple of summer Saturday nights along the Mississippi River will return with the "Stay Late Concert Series." The LumberKings season will bring in some of the best bands and musical talents in the area on six different nights in 2019. Every Saturday home game from June 1st through August 31st will feature a different musical act that will get fans on their feet in the Beer Garden following the game. On Saturday May 18th the Clinton LumberKings will honor local Police, Firefighters, Military, and First Responders for Hometown Heroes night. This year will see the LumberKings take the field in Clinton Fire Department themed uniforms with "Hosette" on the back of each jersey. Lieutenant Eric Hosette fell while in the line of duty while fellow firefighter Adam Cain was injured in January. Each jersey will be auctioned off with the proceeds going to the Hosette family, the Cain family, and Clinton Fire Department. Fans are encouraged to arrive early for a special pregame ceremony. For the second consecutive year the Clinton LumberKings will open their gates for a Fourth of July Eve Car Show and Concert. On July 3rd, while the team is on the road, the Clinton Area Rod Club will hold a Car Show on 6th Avenue North next to the ballpark. Starting at 5 PM, car enthusiasts can feast their eyes on some of the finest four bangers ever made. At 6:30 PM fans of cars and music alike can begin to file into the ballpark for a concert from Bowman, Pickney, and Evans. Tickets for the concert will be $5 with all proceeds going to benefit the Clinton 4th of July Festival. Fans can take part in specials and opportunities for all Tuesday, Wednesday, Thursday, and Sunday home games. Tuesday home games will feature the return of "Two Dollar Tuesdays." The LumberKings will be offering $2 general admission tickets, $2 box seat upgrade, $2 select beers, $2 soft drinks, $2 hot dogs, and $2 ice cream. For all 10 Wednesday home games, fans 21 years and older can join us for "Retro Beer Nights." The offering of beers from a simpler time will be even greater in 2019 with a total of six retro beer to choose from. The retro offerings will ring you just two dollars apiece. All retro beers will be available to fans out of the First Base Beer Stand only. Thursdays will see the return of "Thirsty Thursdays!" All fans 21 years and older can enjoy select beers for just $2 all game long. This offer will not apply to the Fourth of July. Bring the whole family out for "Children's Discovery Center Family Funday Sunday." All 10 Sunday home games will feature free face-painting, free balloon artists, and free postgame kids run the bases. Special ticket offers are available for Sunday's games, two adult and four child general admission tickets are available for just $25. As part of All Faiths Day $4 general admission tickets are available to all fans who show a church bulletin. The LumberKings will also be sporting their Copa jerseys as we honor the Latinx community each Sunday.